does anyone know what the part number is for the clips that hold on the fenderwell trim? I'm looking for this as well. Broke a few fixing my trim last week. I know there are two types used in the front. One has a hole for mounting fasteners, the other is coated black and inserts into a slot in the fender well lower front moulding. if you're talking about the black plastic pins that go in a larger plastic circle, they are available in the HELP! section of some autoparts stores. I'm not sure why they say front and rear since they are both listed on the front fender trim section? Front of the molding and rear of the molding maybe? but I thought I saw Phillips screws back there? Actually the wheel well molding is held on with clips all the way around, there is a screw towards the back that is for the rocker molding. Going to post about that in another thread. 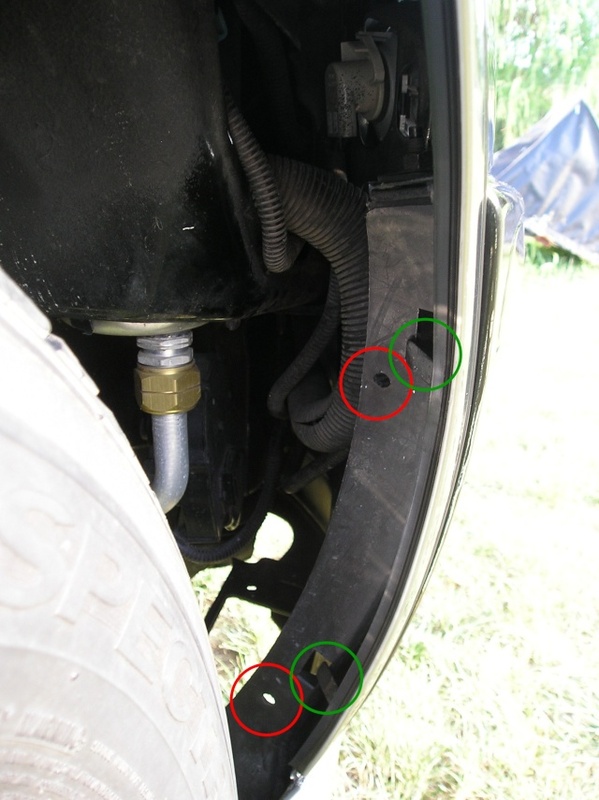 The RED circle is where the pins go for the inner wheel well, the GREEN circle is the solid clip location. I have searched and I am still unsure. I need the retainer clips that are used to attach the chrome trim to the front fender, both part number and where to buy. Also are they sold as a kit or each, and if each how many are there for each side? we are not telling until you give us more pics of your project! They are sold by each. They are pretty cheap. Seriously, just go to the dealer. They are not cheaper by mail order due to the shipping. They are bagged 10 to a bag, there are 2 types (get 1 bag of each and you are probably set). Front retainer should be 25639947, rear should be 25639946. Front and rear refer to the clips' position in the wheel arch, not to whether they are fro the front or rear openings - both types are used in each opening. The 2 bags should run about $40. At the dealer you should be able to get them one by each if you want, too, for about $2.- each. I do not remember how many go on each side and it does not really matter if you get a bag of each. Slide them in from the bottom of one side of the moulding rather than trying to snap them in or you will break most if not all. Some dealerships will let you order/sell you what you need and give you the whole bag! I had this happen at one dealership, they didn’t want to make a home for the leftovers! Others will not though, will make you BUY the whole bag?!? As others here will say, some dealerships will give discounts if you just ask! I usually get around 25% off of list from most of them. Albert is right about getting these at a dealership as apposed to mail order. The plastic on these clips is VERY brittle! 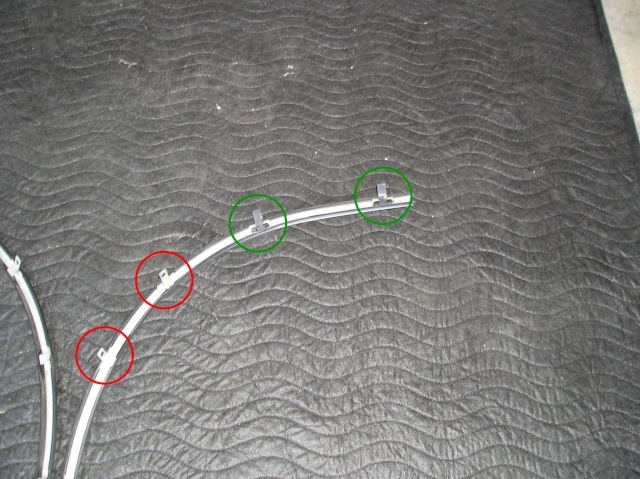 The placement of the clip is determined by where the holes in the inner wheel well are. This might sound like a stupid question but does anyone know if the front fender trim can be removed with the clips still in place? I don't want to break them again and have to order 24 more of them. I'm guessing they can with some careful pulling from inside the fender. Any experience would be MUCH appreciated. Do you mean the inner splash shield? I do not think you can get the splash shield off with the clips in place. The puller tool for the pushpin/clips is like $8. You can also pull the clips with pliers and a screwdriver. They can be reused several times if you are careful. If you need, I have a few brand new clips I can sell you for a good price. Do you mean the wheel well arches? You do have to remove the plastic clips with the pull-out centers before you can release the tabs on the 'chrome' itself. 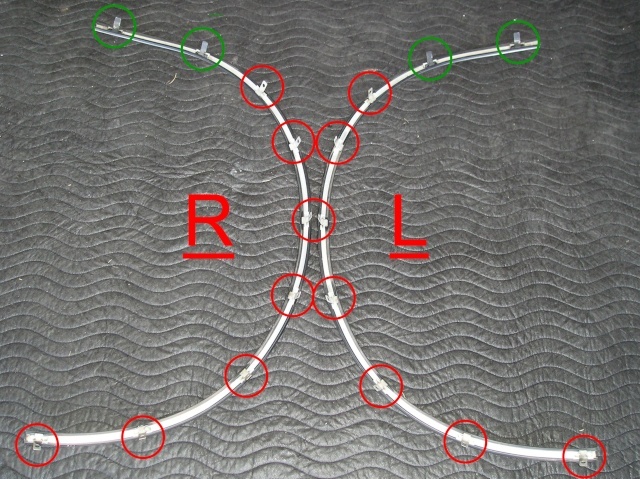 You shouldn't be breaking them, though, if you pull the center pin before trying to remove the whole clip... An easy way to get them started is to use a pair of dikes, parallel with the 'blade' of the center pin, and gently squeeze enough for the wedges to get under the head and start pulling the pin out. This is the same direction as that strange little 'tunnel' that points out to the edge of the clip on one side... Then you can grab the pin with your fingers and pull it out to its stop, or release-position, or just pull it all the way out and put it part way back in before replacing the clip in the car. Mark's got it. Thanks guys. I need to try this out tomorrow. The first & easiest thing to do is to write down your VIN, and take it to the closest GM dealer and have them look up the wheel arch moldings. I stopped by a local GM dealer and ordered just the qty's needed. They were able to locate broken-bag pieces at a couple locations so I didn't have to buy full bags.